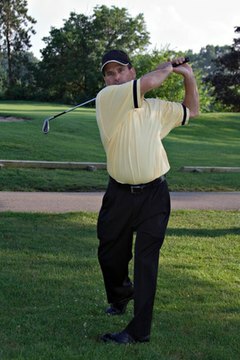 Twisting can sometimes result in neck injuries for golfers. Golfers can experience a range of injuries, from pulled groin muscles to repetitive stress muscle tears in the chest. The neck is also a vulnerable spot and will immediately grab your attention when it hurts. The actions of driving and putting can cause your neck to twist and turn in ways it may not be used to, causing one of several golf-related neck injuries. Knowing how to discern between different kinds of neck disorders can save you days, or longer, of discomfort and possibly help you find the right medical attention to treat the injury. Test your neck for knots. Muscle spasms, also called "knots," can hamper your movement and are usually caused by stress. If the muscle is hard, but not particularly painful or swollen, you are experiencing a spasm which is easily treated at home or by a masseuse. Apply a reusable heat pack (wrapped in a towel or other cloth) to the affected area and massage gently but firmly to loosen the knot and return mobility. Test for swelling, tenderness or soreness. If the affected area is swollen, tender to the touch and is accompanied by "knots," you most likely have a torn or "strained" muscle in your neck. Rest the area, keep it elevated, and apply a frozen ice pack (again, wrapped in a towel or cloth) to the affected area three to four times a day for the next 72 hours. If pain or swelling persist after 72 hours, seek medical attention. Test your neck for "tinglers." Pinched nerves can send shocks of pain up and down your spine that feel electrical. These "tinglers" indicate that a nerve is pinched between vertebra in your neck. Luckily, these are both rare for golfers and self-healing; treat your neck gingerly for about 24 to 36 hours and the problem should clear up. If not, seek medical attention.